Underground, Overground, Roaming High and Low – Run. Ride. Roam. Today was a day to explore the city on the cliff, Orvieto. The funicular won the vote, so we walked down our hill to the station and caught the little cable car up the cliff face to the town centre. It’s quite an amazing place, this medieval city, sitting high above the surrounding valley. 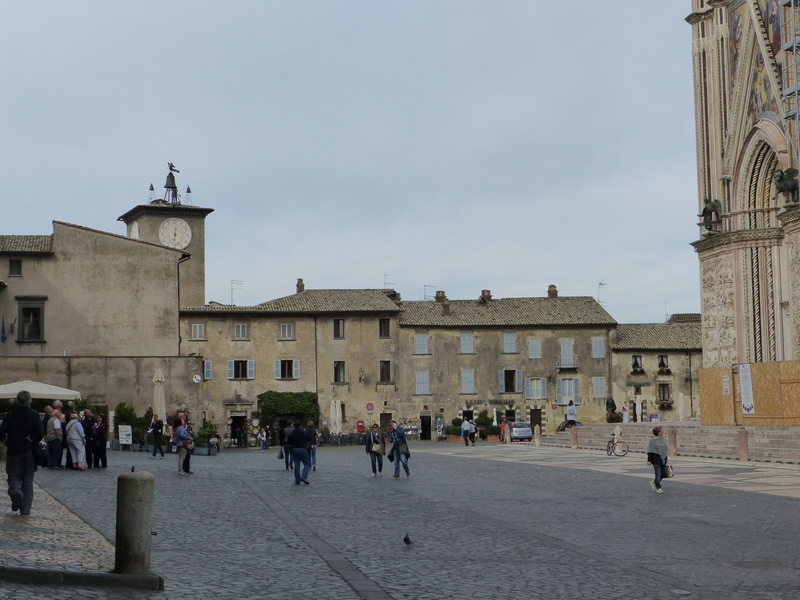 The centrepiece of the town is the grand cathedral, the Duomo and its ornate mosaics and imposing structure, greeted our arrival in the central square. After seeing some of the city from above, it was time to go underground. 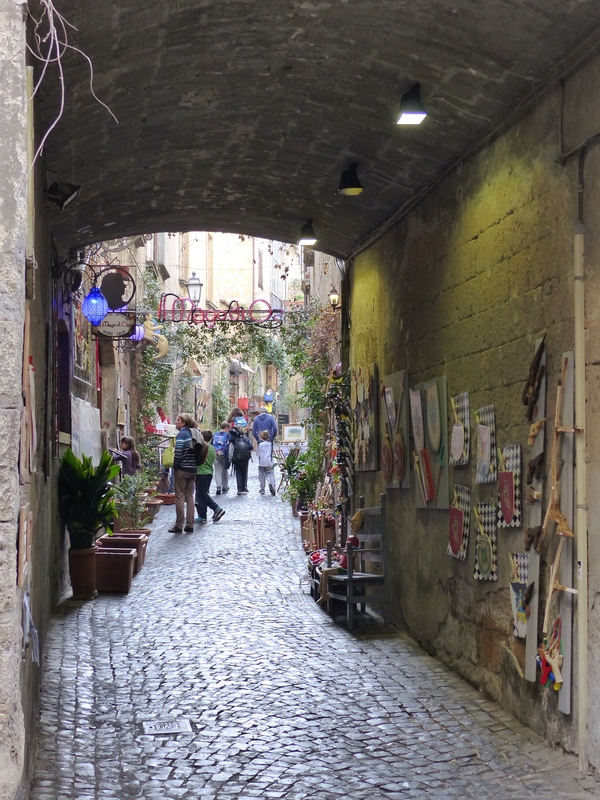 Orvieto has a vast network of underground caves, so we took a tour to learn about this second, subterranean city. It was such an interesting tour and what has been created underground is quite amazing. Here are some of the things I found most interesting. There are 1200 caves under the city of Orvieto. We only went into two of them, because most are now privately owned. 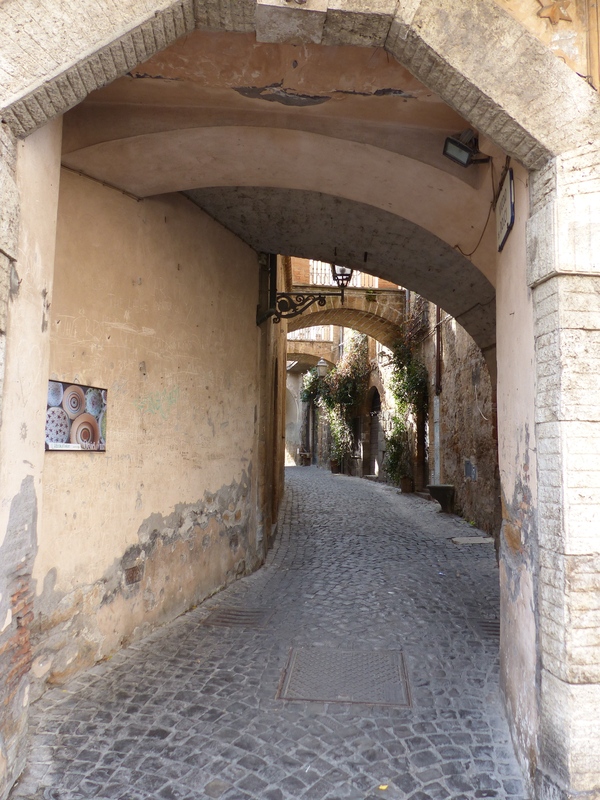 Every house, restaurant, shop and cafe in Orvieto has its own cave, which are now mostly used as wine cellars. Orvieto was established by the Etruscans as a fortress, but the cliff top isn’t very big, so when they needed more space, they went underground and began digging the network of caves. A map of Orvieto. The black lines are the city above ground. 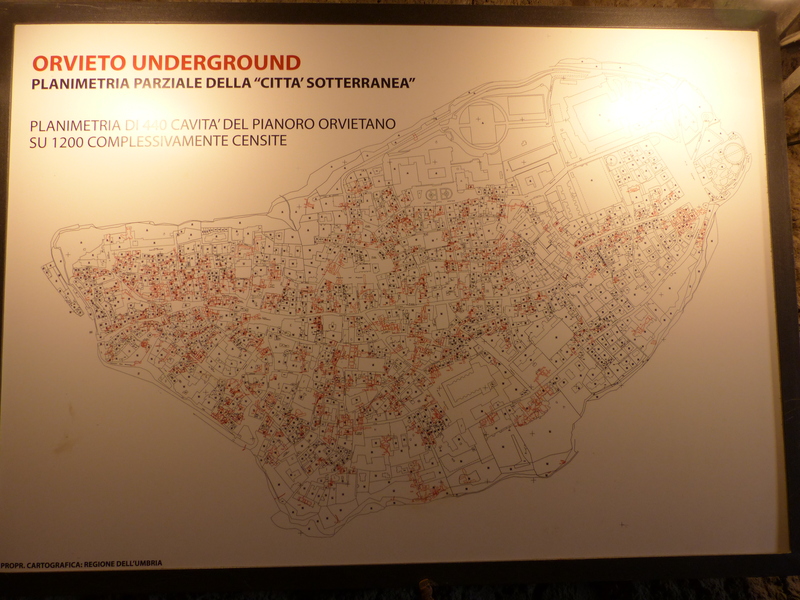 The red lines are the underground caves, so it’s a vast network. 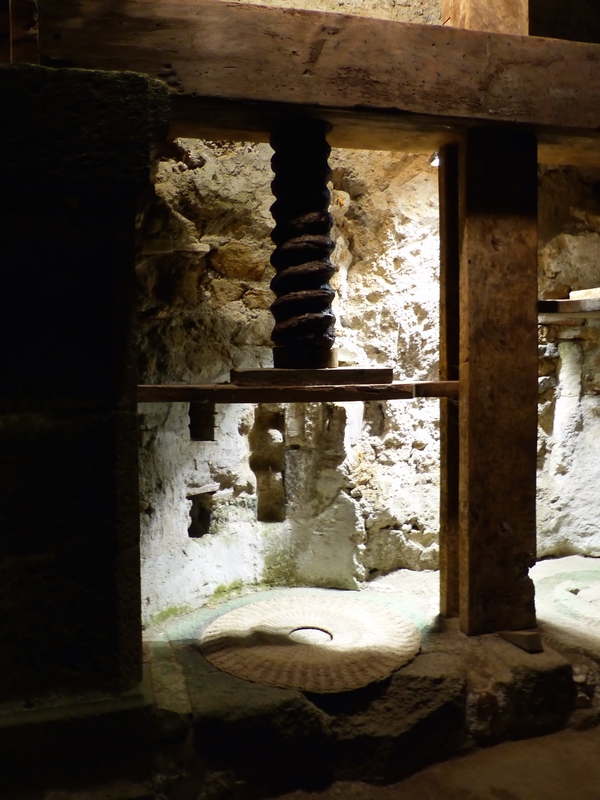 One of their main industries was the production of olive oil, which was processed underground. The olives were ground on big stone wheels, turned by a poor little donkey. Then the olive mush was put between grass mats and pressed to extract the oil. The oil was mostly used as lamp oil. I just felt so sorry for the donkeys. What a life, spending your existence underground, walking in small circles and then living in a cave. …then pressed to extract the oil with this. 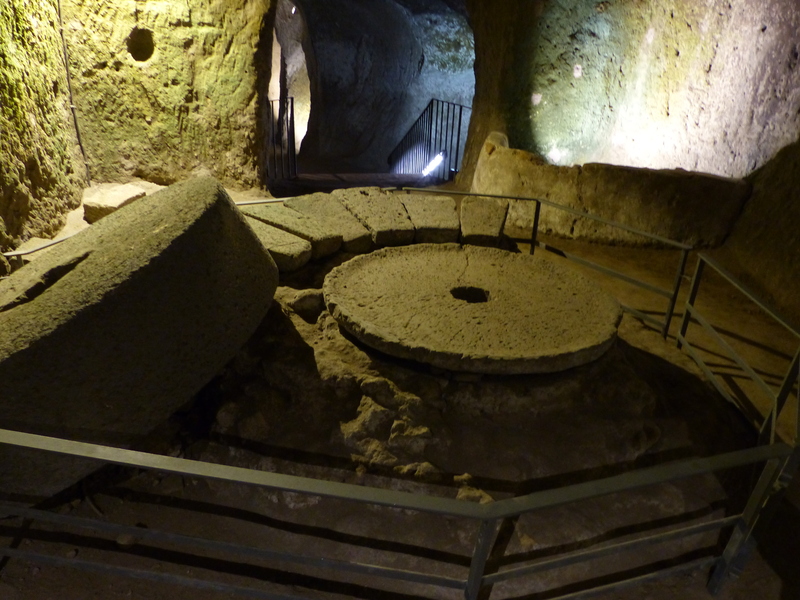 The other industry was the making of concrete, which was made from the stone that was extracted during the digging process to establish the caves. I thought it was so interesting that we could still see the chip marks, centuries old, from the original digging out of the caves. Water was obviously an essential resource, so they dug wells to collect rain water. 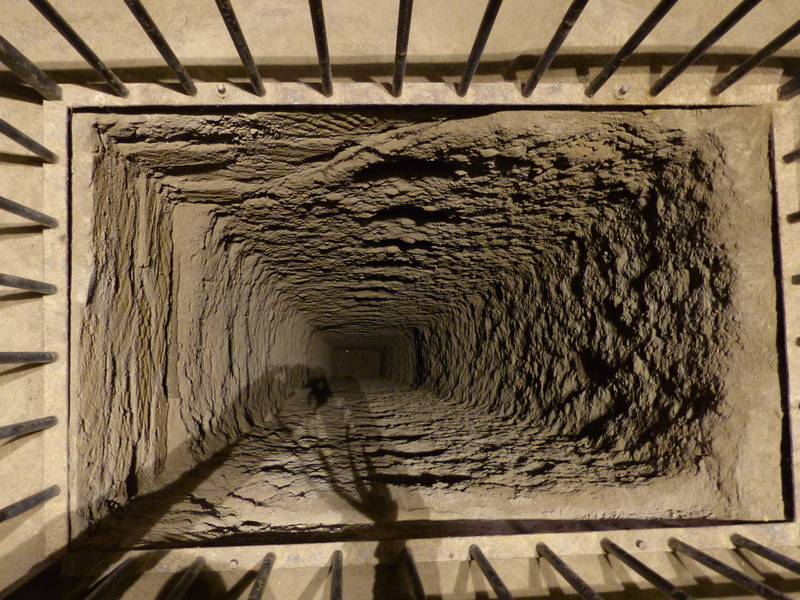 We saw one of these wells, which was 43 metres deep. 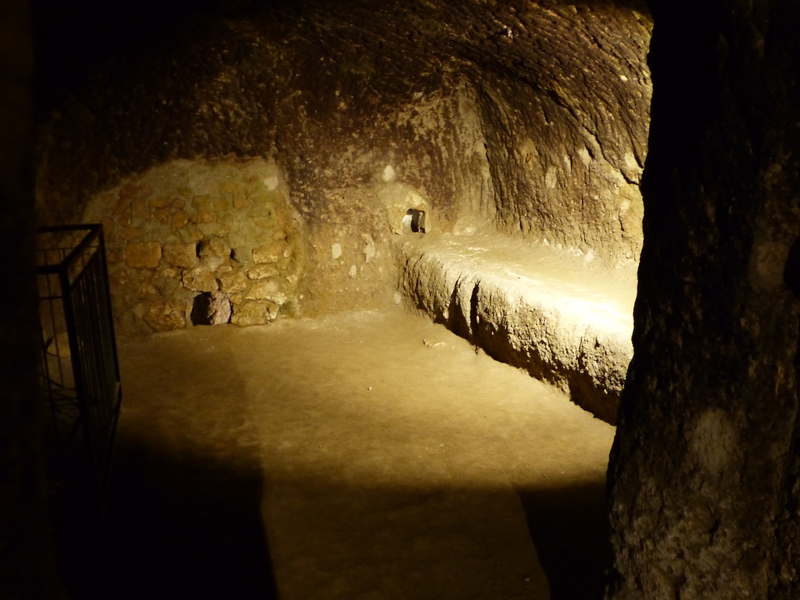 When it was originally used, it was 80m deep, but the Etruscans filled some of it in, because it wasn’t sustainable to keep it that deep, when it came to extracting the water. The wells were dug by a single person at a time, chipping away at the rock and holes were chipped into the side, as footholds. To get the water, a person would walk down the inside of the well, almost doing the splits, with a foot on each side of the well wall, using the holes as places to put their feet, as they edged their way down. What a job! The well, which was even deeper when it was first used. 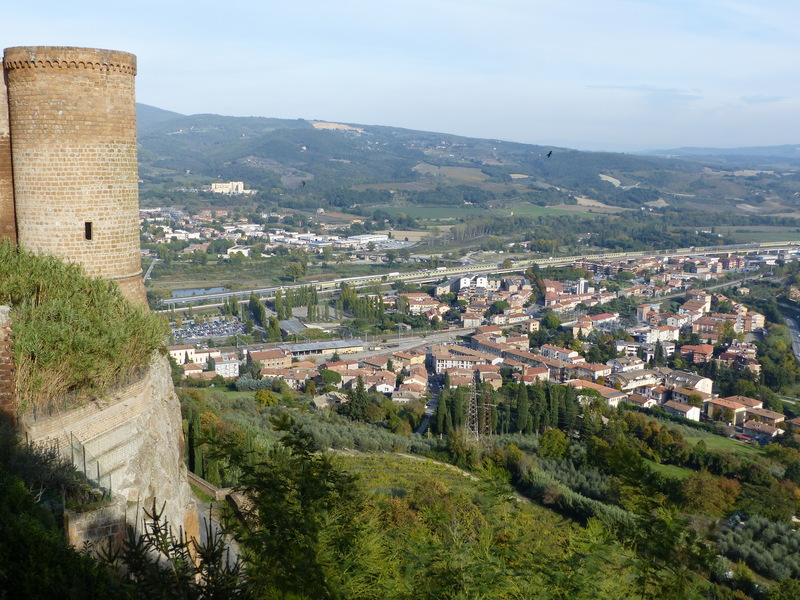 Orvieto was established by the Etruscans, but was abandoned when it was invaded by the Romans. Those Romans! They were very partial to invasions! It was found again in Medieval times and was reestablished and expanded. During this time, another industry was established…pigeons! 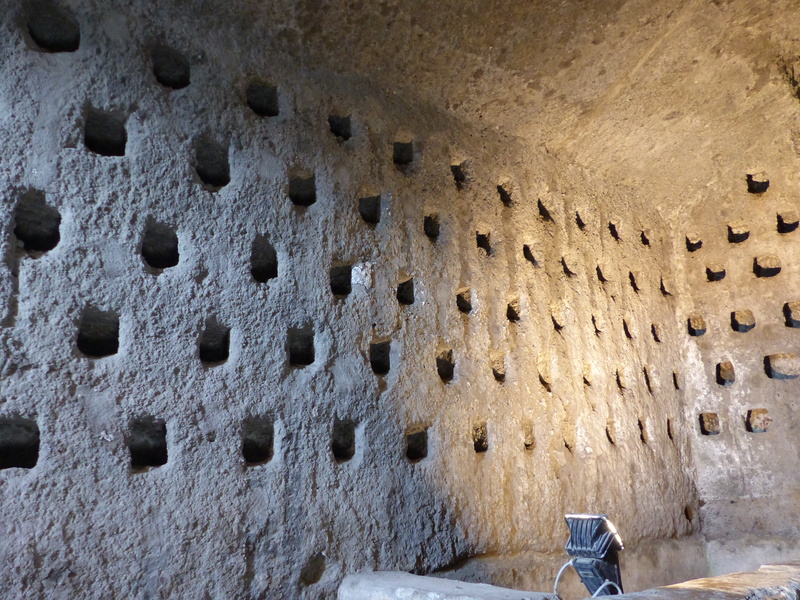 The caves have many rooms that were used as pigeon lofts. Pigeons were easier and cheaper to keep than chickens, because they fed themselves, would go out and fly around the countryside, but would always return to the loft. 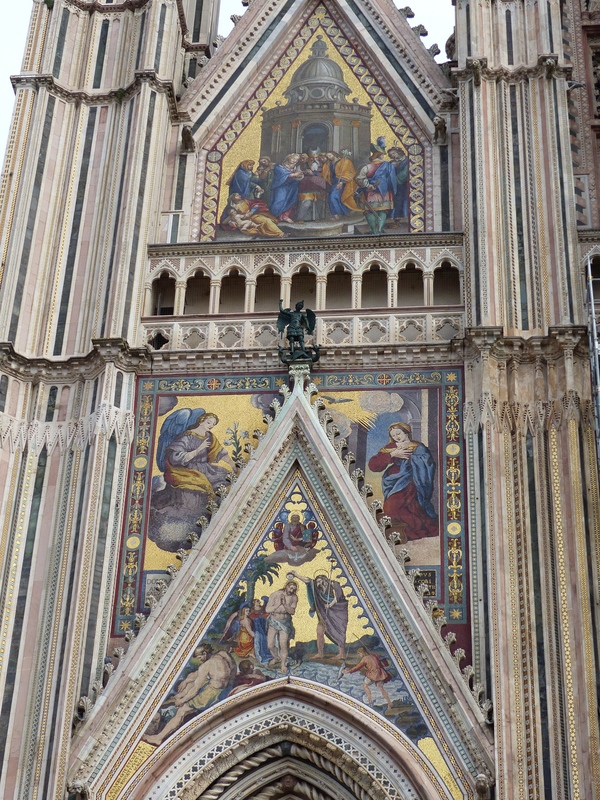 The people of Orvieto then sold them as food, or ate them themselves. All the houses had an internal access down to the caves, so a servant would go down to a pigeon loft and take a pigeon that would then appear on the family meal table. We were told pigeon is still commonly served in the restaurants of Orvieto. The pigeon lofts. The pigeons’ rooms were constructed on the south side of the cliff, so the pigeons could be warm! Pity that cosy life ended in the pot. In more recent times, the caves were used as a refuge during WWII. There was an agreement made with the allies, that the city wouldn’t be bombed, consequently the Duomo survived unscathed. 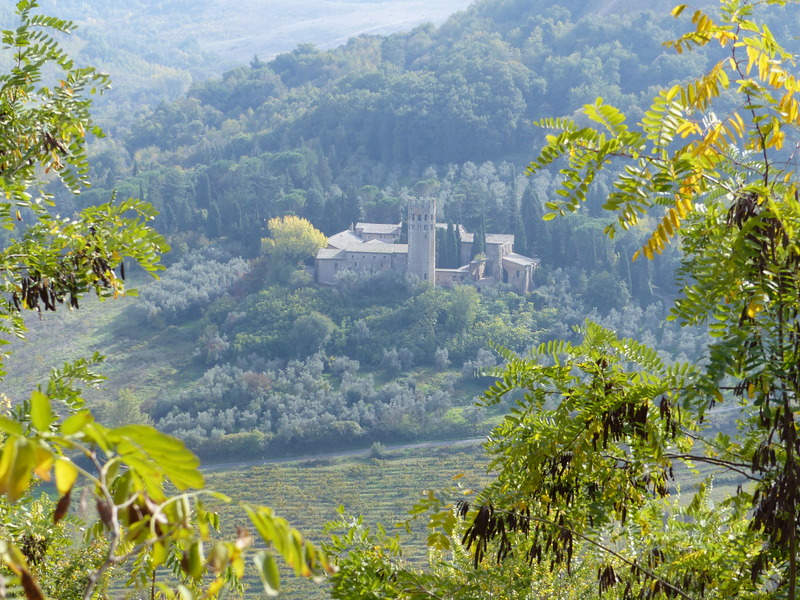 They did bomb the valley though and the town of Orvieto Scalo, so the people who were the victims of bombing, were given refuge up on the cliff top, in the rooms of the caves. 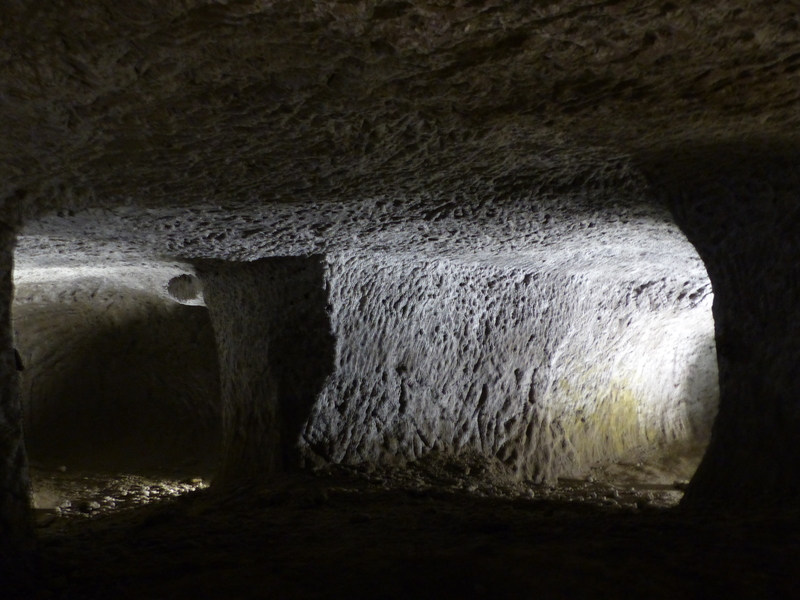 It’s now against the law to do anything more to the caves or to continue looking for more underground rooms, because this would compromise the stability of the city above. They have already put some modern day brick walls underground to support the caves and there are sensors in the city to detect movement, should continued erosion threaten the buildings sitting on the edge of the cliff. It was such an interesting tour. We then spent some time roaming the streets above, along the quaint lane ways. The sun was shining too, which was lovely and we had spectacular views from the cliff top down to the town and valley below and across the hills. We didn’t take the funicular on our return journey, we did actually walk down! It was a steep walk, that required some leaning backwards and short steps to combat the effects of gravity, but is was a nice downward stroll in the sun.